Campbell's Cottage: Wooden Boulder - why now and how? Wooden Boulder - why now and how? Why did the boulder re-emerge just now? Assuming of course that it’s the original. On 8th August a large oak tree fell into the river about half a mile upstream from Maentwrog bridge. I stopped to look and thought it was going to be really difficult to clear, but the following day it was gone! 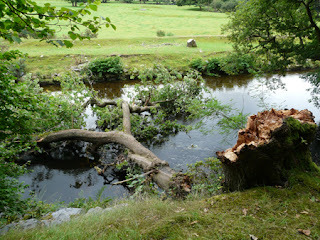 There had been heavy rain and a surge of water washed it away. As it twisted and turned it broke and a large chunk is still upstream of the bridge. The rest of the tree made its way towards the sea and maybe gouged the boulder from out of the mud? Yesterday I watched the tide come in and within an hour the boulder, which had been sitting in a few inches of water, was totally submerged. 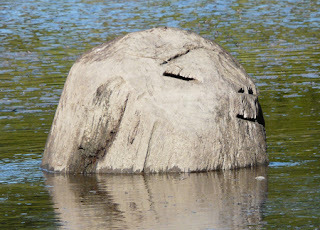 From a certain angle it looked like a woman, at least someone wearing mascara above the right eye, a smile of contentment as if in a hot tub; oblivious to the flotsam, jetsam, tin cans and plastic bottles drifting past. Ten years or so ago it was reported to be near Ynys Giftan. How did it make it this far back upstream? The tide I watched flooding in was 9.2 metres and didn’t budge it. The equinoctial spring tides on 19th and 20th September will be 9.9 metres, maybe then? I’m told there’s a chance of seeing a tidal bore on the Dwyryd and I don’t mean me and my tide tables. Not as big as the Severn’s but a distinct wave rolling forward in a surge up the estuary. There was a tsunami in 1927, a massive tidal wave swept in. A neighbour who lives a few miles inland at the Crochendy Maentwrog (Pottery), showed me the high water mark carved at waist height onto a slate pillar in his barn.